These are the new printers which are currently marketed throughout Latin America; we have to be very careful when installing a continuous ink system. Systems of continuous ink work differently with these cartridges; the truth is that it is not as it is usually done through the hoses system. Most of the procedure is just the same but there is a small step to do with the ink system that will be shown next. If there is trouble installing it, we are glad of providing help. The MP230 Pixma Canon printes are multifuntional printers of Canon. They scan, print and copy. The scaning is done using a software. From experience we can say that if the ink system is installed appropriately, it will work perfectly for a long time. Next the procedure for installing the ink system properly is shown. Before installing an ink system is useful to know the terms of the parts of the system. We have created the post about components of a continuous ink system, look at all parts of a system and you will understand how each of them works. We always recommend our readers to use silicone ink systems, these provide much more flexibility swinging movement of a continue ink system; it tends to get less damaged and run better. Ask your supplier if the ink system if made of silicone. 210 and 211 Canon cartridges. It is recommended to have brand new cartridges. When the cartridges the printer comes with are damaged, it is recomended to buy XL versión cartrdiges since those has better perfomance and printed pages so the printer will work for longer time ink bleeders for 210 and 211 Canon cartridges. See bleeders image. A drill bit to drill the cartridge just the right size of the hose connectors though which the ink is inserted to the hose. See image below. Now we show what the hose connectors for canon ink cartridges are. It may recommend taking these hose connectors to the ironmongery. When purchasing connectors we can not tell an exact dimension because it varies but in the ironmongery you can get the wick to fit the connectors and thus perform an installation without any air leak. — It will be needed a continue ink system for four color canon printers. Normally the continue ink systems bring all the appliances as shown in the image above, however, we are specifying some tools that some systems do not bring. — Water based or dye ink, in case of having pigmented ink only; it can be used as well. It is recommended to see our post about the difference between dye and pigmented ink. These systems are provided with 4oz of ink in the tanks. — It is adviced t oread this post carefully to avoid confusión. Even though have followed this entire procedure there are ways around that something gets wrong, so please contact us through a comment on this post, we will help you immediately. These steps have to be followed as they are described in this post. To start, locate yourself in a place where ink spilling does not matter and use gloves to protect your hands, a piece of fabrico or plastic to avoid outpouring. First of all, the way the continue ink system should be place in PIXMA MP230 Canon printers will be shown. To do so, the following images are provided, this is a continue ink system already working properly, this way you can realize how the system should be in these printers. This has to be placed as shown in the picture with the fold presented there, these ink systems as mentioned above are easy to install. It is the same procedure that is presented next, it just that when inserting it, the procedure below needs to be followed. If you have any questions, please contact us by leaving a comment in this post. See following images. This has to be placed as shown in the picture with the fold presented there. This sensor for MP230 pixma printers. If you want to get the sensor to tell the printer that the cover that gives access to cartridge is clogged, you will have to find one in the right side of the lock of the printer, where you will get a small piece that when being pressed down tells the printer that the lid is closed. See picture above, if you have questions write a comment. 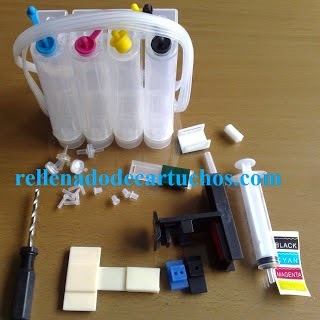 Before installing the continue ink system take into account to check that the cartridges are not clogged. This task is mostly perfomed with new printes, however if the printer is a second hand printer or used printer, it is adviced to check if the cartridges are working together with the heads and providing a good printing quality. To do so, print a test page. It is possible the users guide book of the printer to be required to being able to install the printer and first uses of it. Although the printer is new, it is recommended to test the functioning of the printer by making various printings and check the full operation of the equipment and then start the installation. See post on how to print a test page. After obtaining a test page and knowing that the heads are well, turn the printer off, lift up the lid which gives access to the ink cartridges and unplug the printer from the power feeder cable. You can move the cartridge carriage when the printer is off, this does not affect the printer, try to do it very carefully and slowly. Put the ink cartridges where you can get them easily. Take out the ink cartridges from the printer. If you need help getting the ink cartridges out, you can visit our post on how to remove ink cartridge of canon printers, be very careful when removing the ink cartridges and do not touch the ink cartridge connectors and try not much touching the heads of the cartridges. It is even recommended to keep the small packaging the cartridges come in to place the cartridges inside them again when perforating. See image “what are the ink heads and connectors.” Indicator one are the cartridge connectors and indicator two are heads of the cartridges. 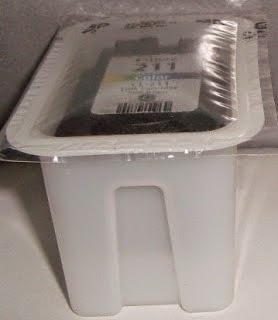 When talking about plastic packaging of 210 Canon cartridges and two 211 it refers to what is shown next, as stated above, it is suggested to drill the cartridges being inside these packages to avoid contact with the connectors and the head of the cartridge. This step consists on the ink cartridge drilling for the installation of hoses, to do so there is the drill bit mentioned before. An image showing where the cartridge must be drilled is shown below. Important Note: In the image the cartridge piercing is showns, we recommend covering the hole that brings the cartridge on the top and make the hole a little below to the left. When talking about a bit, it is talking about the distance iqual to the size of a hose of the continuous ink system, this will prevent the tricolor ink cartridge not to be recognized in the future because the printer has a piece on the head that will not allow the connectors completely reach the printer. After having two ink cartridges with the hose connectors installed, proceed to fill the ink tanks, to do soabout 4 ounces of dye ink are needed. Install elbows to the hoses of the continuous ink system, elbows are, as the name says, small elbows to help the ink system fits the design of the printer and disrupts the process of the printer. 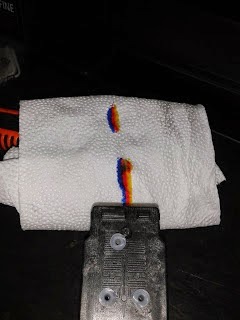 We connect the corresponding colors for each color in the cartridge, if needed, the distances of the hose cuts can be checked by testing the printer. Now that the cartridges are completely installed to the continous ink system, what comes next is to make the ink get into the cartridges. To do so we use the bleeder of the ink cartridges. This tool is really useful since with it we can get the ink from the cartridges when they are being refilled. In this case we will get the ink out of the cartridges and will make the ink which is into the ink tanks completely reach the cartridge and the hoses get completely full of ink. When we see that the ink has completely reached the cartridge we will stop to avoid it to go over the edges of the ink cartridges because this would cause the ink to spill inside our printer. After the ink has reached the cartridge, the hoses will look this way near the ink cartridge. The ink has already reached the cartridge as can be seen in the image below. Another way to make the ink reach the cartridges is by means of an empty syringe without the needle to introduce air inside the tanks of the system, this air will make the ink reach the other end of the ink system. To do so the hoses cannot be connected to the cartridge. We apply air and quickly when it is reaching the other end, introduce the hose elbow to the ink cartridge. If what we want is to use this method, we have to do the same procedure for each color. See the image below. Any residue in the printer has to be cleaned to avoid the pages from being stained; much care has to be taken with the areas where the pages go through in case during the cartridges bleeding some ink has been spilt. It must be cleaned with napkins and no residues shall be left from the napkins either. After all the procedue described before, the installing process come next. Do it as it is shown in the picture below. 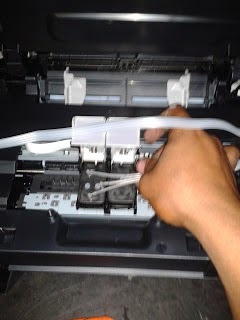 Check the ink hoses not to rub againts each other to avoid the printer carriage to get stuck since this will be shown as an error in the future. Last thing to do is to print a test page now that the whole ink system is installed. Look for the sensor that indicates when the lid is opened and printing would be able to be done while checking if there is any obstruction in the cartridges or the hoses. After being sure there is not obstruction, put the hose in its place and start printing. If you have any questions, leave a comment in this post and we will help you.